Whether you are decorating a baby’s police nursery theme or an older kid’s police theme bedroom, you will find yourself lacking in available accessories. However, we have never let the absence of store bought bedding, window treatments and decorations deter us when we find a cool bedroom theme for kids so stick around and check out our ideas for law enforcement theme room designs. Ready made police crib baby bedding sets are rare although you might be able to find a set that features a combination of fireman and police motifs. 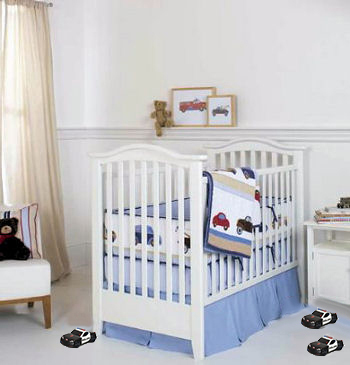 If you don’t want bright red fire trucks to compete with your blue or black and white police cars; chances are that you will either have to make your own or have your baby bedding custom made. If you can’t find crib bedding with police themed fabrics, don’t despair. In a way, that can be a good thing because it will expand your selection of color scheme, prints and patterns. Plus, your baby will have a set of nursery bedding that is completely unique and the rest of the room will follow suit. Once you find your fabric, buy a suitable number of yards to make your crib comforter or quilt, your window treatments and a crib skirt or dust ruffle. If you have a few yards left over, use them to make accent pillows or cushions for the rocking chair. Don’t worry about the crib sheets; just buy solid colors to match the bedding fabric. 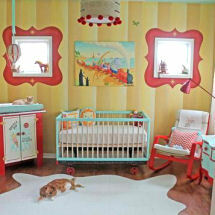 Go here to see more to see more ideas for matching your police nursery decor with various crib sets available. Even if you can’t find a set of bedding with police print fabrics that you like for your police theme nursery for baby and have to settle for a set of solid blue or vintage black and white there are ways to get the look that you want through the use of decorations and accessories. Use traffic signs to decorate the walls of your police nursery theme to give a nod to the traffic cops on the street. Don’t let the lack of commercially manufactured decorative items to use in your police nursery theme stop you from honoring the policeman in your life by decorating your child’s room in this theme. We may have to be more creative and transform toys and associated motifs to use as decorative accessories, but the end results will be wonderful and worth the effort. Return to Unique Baby Gear Ideas to find more police themed baby bedding and decorating ideas that will make the law enforcement officer in your life smile.